Nomination of Comrade M.S. Raja as a Staff Side Member of Standing Committee of National Council (JCM) vice late Comrade S.K. 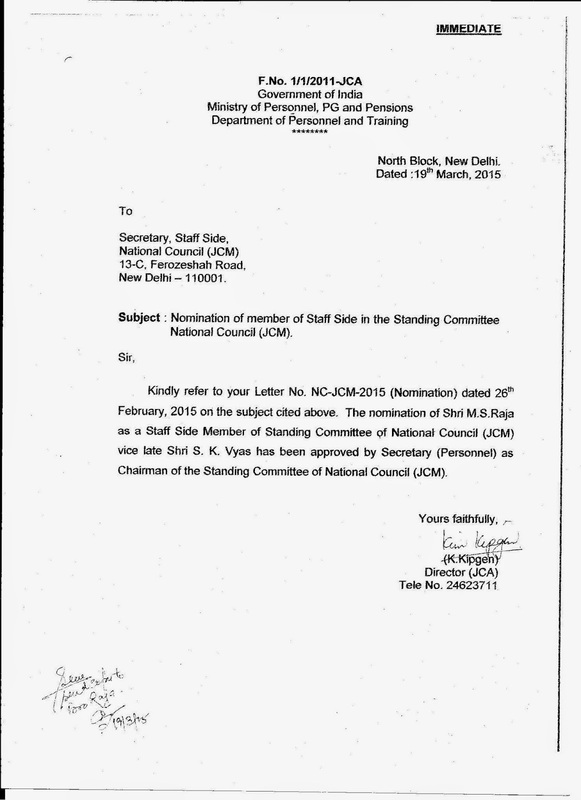 Vyas has been approved by Secretary (Personnel) as Chairman of the Standing Committee of National Council (JCM). Department of Pension & Pensioners Welfare issues an order explaining as to why only S-29 Scale Pensioners were given the benefit of implementation from 1.1.2006 while all the remaining Pre-2006 Pensioners got to wait!! The Order says that since the Supreme Court had finally disposed of one writ petition related to S-29 Pensioners, it has been implemented to them. For others, until the remaining 3 Writ Petitions are not disposed off, the Government will not implement!! The orders for implementation of the decision taken by the Government on the recommendations of 6th CPC for revision for pension of past pensioners were issued vide Department of Pension & Pensioners' Welfare's OM dated 1.9.2008. The provisions of Para 4.2 of this OM were clarified vide this Department's letter dated 3.10.2008. 2. The Hon'ble Central Administrative Tribunal, Principal Bench, New Delhi in its common order dated 1.11.2011 in four petitions [OA No.655/2010, 306/2010, 50712010 and 3079/2009] directed that the past pensioners may be granted, w.e.f. 1.1.2006, a minimum pension with reference to the fitment table applicable for revision of pay of serving employees. 3. A large number of representations from pre-2006 pensioners are being received by the Department of Pension & Pensioners' Welfare for extension of benefits similar to what had been allowed in case of OA No.655/2010 by CAT, Principal Bench, New Delhi. 4. In this context, it is informed that four Writ Petitions were filed in the High Court of Delhi challenging the order dated 1.11.2011 of Hon'ble CAT in four OAs. These petitions were dismissed on 29.4.2013. Subsequently, four SLPs were filed in the Hon'ble Supreme Court over a period of time against the said order of the Hon'ble High Court. Of the four SLPs, the one pertaining to Central Government SAG (S-29) Pensioners' Association which was first in the series of said SLPs, has since been dismissed by the Hon'ble Supreme Court on 29.7.2013. As the Review Curative Petition against the said order dated 29.7.2013 also failed, the Government of India decided to comply with the order by extending the requisite benefits to the parties involved in the said SLP. As regards the other three SLPs (Nos.36148-50/2013), Hon'ble Supreme Court in its order dated 19.11.2013 issued notice and made the following observation: . "Learned Counsel for the respondent submits that during the pendency of these petitions the respondent-writ petitioners shall not precipitate the matter by filing contempt proceedings either before the High Court or before the Tribunal. That statement is recorded. " 6. This is the information. 7. The outcome of SLPs under reference in Para (4) would be brought to the notice of all Ministries /Departments. 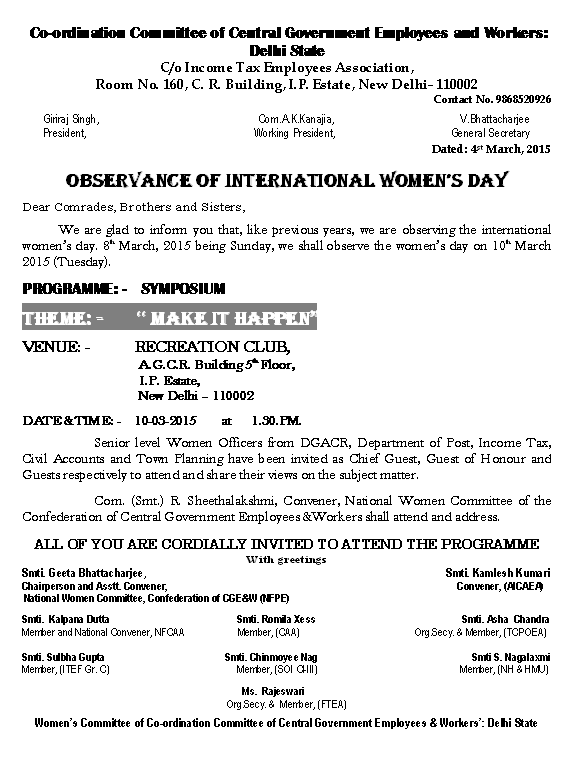 It’s my honour to address you all on the occasion of ‘International Womens Day’ on 8th March 2015. 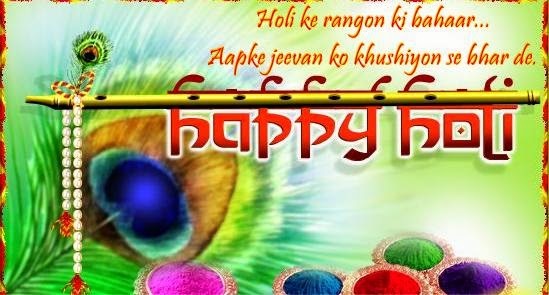 This day is a celebration of the struggle of women, the world over, and their achievements, in realising the just and equitable role and position for women in society, in workplace and as a homemaker. This day is also a reminder of the road ahead, the enormity of the tasks that still stare at us. This day is a day to resolve, to rededicate ourselves to the task of women emancipation and empowerment. The word ‘woman’ is not singular, it is a plural noun. If the Oxford Dictionary says otherwise, we need to let them know why. A woman is always an eco-system, balancing multiple roles, multiple commitments, at multiple places of work – both in office and also at home. There might be CL, EL etc in office, but there is not a single CL or EL in house. Good health or bad health, the tasks of bringing up children, and other home-making works don’t give any break. In addition to these, many of us are engaged in other interests like music, painting, culture, sports etc., and it is really a miracle that women manage to do so many things, and still appear cheerful and charming. The word multi-tasking doesn’t find more resonance anywhere. In fact, women contribute more to the society. If you educate a man, you are educating one person. If you are educating a woman, you are educating a family. In spite of the effervescent and vibrant roles that women play as mothers, sisters, daughters, friends, soul-mates, co-workers and in social service, women are often trampled upon in world societies, both in war and peace. The past year witnessed some of the most horrific incidents that shook our sense of humanity. 276 school-girls were kidnapped in Nigeria in April 2014, and not released till now. According to Amnesty International, hundreds of Yazidi women were sold by ISIS into sexual slavery. Using women as soft targets is a blot on humanity and questions the very meaning of civilisation. Even in the civilised and sophisticated corporate world, many business shenanigans squirm at the thought of giving equal pay and respect to their women employees. This year witnessed the most distasteful episode of Microsoft CEO’s statement that women should accept their karma, when he was asked about equal pay for women in software industry. This shows the deep-rooted prejudice that women are burdened with, and the enormity of the road ahead of the women’s movement in India and the world over. We can fight this only with deep understanding and belief in women’s capabilities and strengths. Even under the weight of all the prejudices, women have been charting stellar performances everywhere. Not only the immense multi-tasking roles and expectations that every woman upholds, many are blazing a path of leadership and success, leaving a trail of pride and inspiration, not only in regular careers but also in high tech scientific and futuristic fields, which are traditionally considered as male bastions. Smt. Padmashree Warrior from Vijayawada is the Chief Technology & Strategy Officer (CTSO) at Cisco, which powers the world’s telecom architecture. She is in-charge of the telecom machinery which runs our mobile phones, internet and whatsapp, for present and for future. Indra Nooyi from Chennai is Pepsi’s global Chairman & CEO. Mary Kom became Olympic Bronze medallist and Asian Gold Medallist in boxing, when she was a mother of three. Kiran Mazumdar Shah of Biocon is a genetics entrepreneurial wizard, having a street named after her in Australia on 5th March 2015. There are lot more stellar achievements of working women in business and other spheres. These achievements are just a pointer to show that all that a women needs is a little enabling. Enable the women, and they will do wonders, to the families, workplaces and the societies. Give women the right education and training, safety in work-place and transit, freedom from violence and discrimination, respect as an equal gender, belief in their capabilities – the society will transform into a much better place. There is no better time to realise and rededicate to this goal, than the year in which Malala Yousufzai got the Nobel Peace Prize for fighting for education. There is no easy path to achieve this, and I call upon all women comrades, to struggle for equitable rights, with passion, determination and hunger for success. On this momentous day, it’s our duty, of everyone - common people, men and women comrades, the leaders, the policy makers and the government - to understand and appreciate that women deserve their rightful equitable empowerment. In fact, this year, we are also observing 20 years of Beijing Declaration on Women’s Rights. UNO declared the campaign slogan as “Empowering Women, Empowering humanity”, i.e. if we empower women, we empower humanity. The theme for this year’s International Women’s day is rightfully coined as “Make it Happen”. On this occasion, as Chairperson of the Women’s Committee of the Central Government Employees and Workers, I call upon everyone to join hands and give a clarion call – Yes, we will make it happen. 1. Effect wage revision of Central Government employees from 1.12014 accepting the memorandum of the staff side JCM; ensure 5-year wage revision in future; grant interim relief and merger of 100% of DA. Ensure submission of the 7th CPC report with the stipulated time frame of 18 months; include Grameen Dak Sewaks within the ambit of the 7th CPC. Settle all anomalies of the 6th CPC. Make It Happen is the 2015 theme for our international women’s day.com global hub, encouraging effective action for advancing and recognising women. Each year International Women's Day (IWD) is celebrated on March 8. The first International Women's Day was held in 1911. Thousands of events occur to mark the economic, political and social achievements of women. Organisations, governments, charities, educational institutions, women's groups, corporations and the media celebrate the day. Various organisations identify their own International Women's Day theme, specific to their local context and interests. Many charities, NGOs and Governments also adopt a relevant theme or campaign to mark the day. For example, organisations like the UN, Oxfam, Women for Women, Care International, Plan, World Association of Girl Guides & Girl Scouts (WAGGGS) and more - run exciting and powerful campaigns that raise awareness and encourage donations for good causes. The UN has been declaring an annual equality theme for many years. Confederation National Secretariat calls upon all affiliates to hold Protest Demonstration at all important centers and in front of offices on 3rd March 2015 against the Pro-Corporate , Anti -Worker, Anti- People and Anti- Central Government Employees UNION BUDGET of Modi Government. The Budget of Modi Government for the year 2015-16 presented today to the Parliament by the Finance Minister, Shri. Arun Jaitley belied all expectations of the poor people who placed their faith in the BJP in the last general elections. It is without doubt an anti-poor and pro-rich Budget. The Corporate Tax has been slashed to please the giant multinational Corporate houses, who really are the rulers in most of the Countries of the world, including ours. The Government has foregone about 8300 crores of direct tax revenue. The burden has been put on to the shoulders of the common working people in the form of indirect taxes to the extent of more than 23000 crores mostly coming from the increased service tax kitty. Except raising the transport allowance exemption from Rs. 800 to Rs. 1600 p.m which only benefits the higher segment of tax payers among the salaried class, no concession or tax reduction has been given to the wage earners. By not raising the non-taxable maximum which was needed in view of the high level of inflation, Modi Government has not only squeezed the middle class but also amassed more tax revenue from those class of wage earners, who get dearness compensation. In the process Government continue to ignore several judgements to exempt DA from taxation as DA is considered as a receipt, compensatory in nature. The salaried class of tax payers was constantly demanding the re- introduction of deduction under section 16(1) of the I.T. Act which was in vogue years back. While retaining such concessession and deduction to all other segment of tax payers, the Government continue to penalise wage earners who are really the honest tax payers. Allocation for every social welfare schemes which targets the deprived section of the society has been reduced in percentage terms, the largest reduction being in the ICDS programme. The tax concessions to the rich and corporate houses are of the order of 5.89 lakh crores. This apart, the wealth tax has been fully abolished. The Budget 2015-16 has unambiguously declared the intention of the Modi Government to pursue the neo- liberal economic policies vigorously.